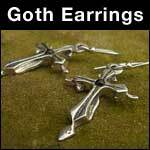 GOTHIC JEWELLERY : BRITISH Made : LOVE2HAVE in the UK! The BEST! 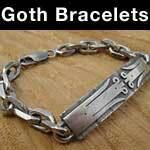 British made Gothic jewellery all handmade in the UK at prices you can afford. Fully guaranteed and returns accepted. There has always been what is known as a 'Goth' scene worldwide - young people wearing white makeup, dying their hair, and wearing black clothes that listen and dance to alternative music. The fact is, we too like this scene very much and therefore have a keen interest in the Goth jewellery market. Bands such as The Cult, Killing Joke, The Mission, New Model Army, Bauhaus and The Sisters of Mercy are all on our regular playlists, together with the occasional concert too if they happen to be still playing. 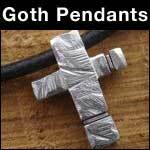 The wearing of Gothic jewellery is an integral part of the image, but do a search for Gothic jewellery, and you will find endless sites selling cheap silver cast skulls, crosses and bat wing type tacky jewellery, most of it imported we hasten to add. At Love2Have we like to think that we can cater to the higher end of this market. 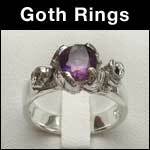 We provide a range of Gothic bracelets, Gothic necklaces, Gothic earrings and Gothic rings all made individually and designed to the highest quality. 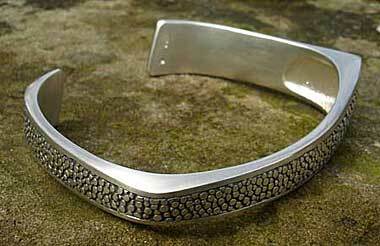 While the jewellery does appear expensive at first glance, there is no accounting for quality. These pieces are designed to last and to be something you can keep and treasure for a very long time if looked after carefully. Much of the jewellery in this section features elsewhere on our site in the men's jewellery and women's jewellery categories also.